Once again we have Donald teamed up with Chip and Dale. There will be a lot of Chip and Dale shorts in the bottom 100, since many are worth watching, but few are true time-tested stand-outs. Donald Duck spent most of the late 1940s and 1950s paired with bees, Bootle Beetles, or Chip and Dale. Many of these are directed by Jack Hannah. The story this time is typical Chip and Dale fare. Donald has come to do a little surgery on his tree, which just happens to be where Chip and Dale are residing. Donald decides to be mischievous and taunt the chipmunks for awhile with various trimming tools until the chipmunks fight back. What I like about this one is that the story isn't born of a misunderstanding. This time around, Donald's just being a bit of a jerk because he gets off on pranking other people. This was always an element of the character, going back to some of his earlier shorts. It's been said a key to his character is that he can dish it out, but he can't take it. This short is a prime example of that philosophy and it's nice to see it's still alive in the '50s. Even in the later cartoons, when they really get Donald's character, it just works. Donald is not bad-natured or mean outright, but he does enjoy a bit of schadenfreude from time to time. It's worth pointing out that while he enjoys teasing the chipmunks, he doesn't want to hurt them, and indeed he even helps Dale from falling at one point. And it's all right because the tables usually turn on him by the end. Here, Chip and Dale aren't being pests, like in "Three For Breakfast" where they steal his food; he just wants to mess with them. You can also see the difference in character; when Donald causes Dale pain, he walks away and says, "That's funny," but when Dale causes Chip pain, his first words are, "Gosh, I'm sorry." Chip has elements of Donald's temper in this one, but maintains his friendship with Dale. In a way, the two chipmunks are split elements of Donald's psyche, especially in this one; Dale is the good-natured fun part that causes slapstick fun, Chip is the thinking one who is easily frustrated. But both exist harmoniously, while Donald is often at the whims of his temper. This short is also another step in helping to define who Chip and Dale are as individuals. One element I don't always get to discuss in these posts is the background art. I wanted to highlight it here, because I really love the simple but artful way the backgrounds are handled in this cartoon. to suggest being up in a tree, the backgrounds are varying shades of green, with leaf patterns layered. The colors are soft and blend into each other like airbrush or watercolor. It's effective, and really quite lovely in its own way, perfectly capturing the setting but never pulling focus from the characters. Later, when the story shifts to the "hunt" to kill the "monster", the backgrounds become bluer and a little foreboding to match the mood. The limbs become denser and more shadowed. It's very effective. There's a bit of clever design with Donald's shears, as they ever so slightly evoke the head of a bird. This is then carried on with Donald's "behavior" of it. Consider that the animators have to animate the notion of Donald animating an object, and all with very minor things that give the illusion of life. This is the craft of animation at its finest: to make something appear alive. We don't even question it in the context of the cartoon, but consider how just a few curved blades and a well-placed screw add up to a perfect design element for this gag. It's all about convincing Chip and Dale that it really is something alive, and it works. I've come to really love moments in Disney cartoons where inanimate objects are allowed to have the appearance of their own agency. As you'd expect, the short eventually becomes a chase. While it doesn't last very long, the little chase in the treetop is energetic and fun in the way the layout has limbs that twist here and there. 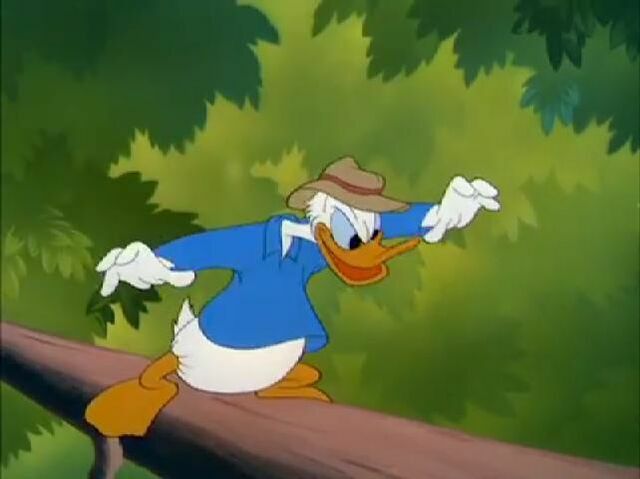 Donald finally taking a lawn mower to the leaves in frustration is a clever idea with very cartoony execution, as his speed is such that he can travel over empty space between branches as if none exists. He even gives the chipmunks a close-call haircut. Something about it seemed odd-looking to me until I realized why: Donald has shaved their ears off! But they don't seem to be hurt by it, and it is a visual gag that I'm sure probably wouldn't work well otherwise, the way their ears are placed. I don't think we're meant to truly consider their mutilation. My main criticism of "Out on a Limb" is the geography and continuity of the limbs themselves. The very first thing Donald does is chop the limb in front of Chip and Dale's door. So after that whenever they go in and out, they have to somehow hop on other branches to get in, and this means branches will suddenly appear or disappear as they are needed. This bit of discontinuity is unfortunate in an otherwise nicely-conceived cartoon. On an unrelated note, I want to give a thank you to anyone who is reading this and/or is interested in the list. I'm sorry that it's been a long time since I updated. I plan in the future to post a list of upcoming shorts so you can get a better sense of the countdown. We're only in the early stages; the best ones are yet to come!